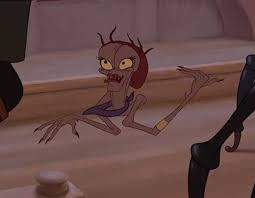 I was Directing Animator for Silver’s crew of alien pirates on “Treasure Planet“. My experience inventing Pegasus‘ movements (in “Hercules”) combining elements of birds and horses gave me a unique insight to figuring out how the aliens were to move. This required lots of research, imagination, and experimentation. Birdbrain Mary was a huge head, a pelvis, and 2 appendages that functioned as either arms or legs, depending on her action. Fishbreath had a seal-like body and 2 arms with suction cups instead of hands. Makriki had 4 legs (2 forward and 2 backwards) 2 arms, a long lizard body, and eyeballs inside his mouth. Turnbuckle had 4 octopus arms, 4 octopus legs, eyes on long stems, and strutted like Robert Mitchum. There were 8 aliens altogether who were my responsibility. Hand-animated characters and 3-D camera moves that used the z-axis were some of the challenges on this film. Combine those technical gymnastics with animating characters with multiple leg configurations and other weird body parts. Wow. The entire film was a mind-bender. And, I really enjoyed the challenge. I learned that I could figure out just about any problem I faced. 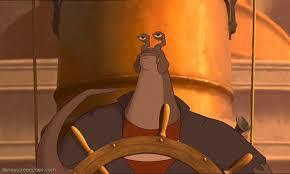 “Treasure Planet” made me fearless. I will try anything with my stone sculpture. Any stone as long as it is not poisonous. Weird animals that strike a responsive chord. Poses that might be risky in stone. Sculptures like “Take Flight” and “A Tree Needs A Bird” required extreme creative gymnastics. Confidence is power. So is knowledge. If you go forward with both, I think it is an unbeatable combination.